While this isn’t a traditional forward-facing portrait I think it captures Ryan’s sense of adventure and his belief that nature is full of magic. If he has his hat, camera and a stick he’s prepared for anything and from my second-in-line trail place I’m ready to document our travels. 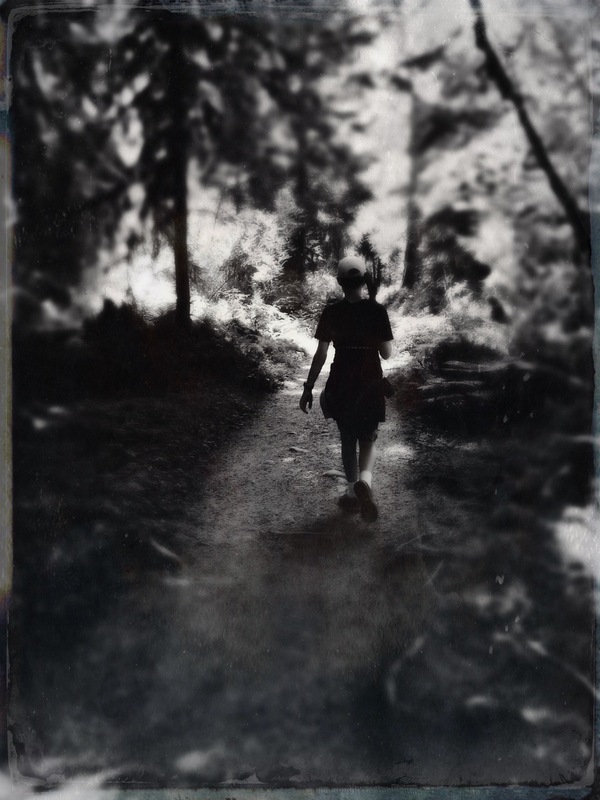 This moment is from our August day in the Hoh Rainforest and the processing is the result of my first day experimenting with Hipstamatic’s Tintype app. Posted as part of Lens and Pen by Sally’s Phoneography and Non-SLR Digital Photo Challenge: Portraiture. It’s funny that’s the position I’m often in too for taking shots while walking! Thanks, Seonaid. 🙂 Sometimes the view from behind is the best! I like the anonymity of the portrait–sometimes that not knowing is a reason to return to an image. You’ve placed him in Mother Nature and the post processing gives it another layer of the unknown. Few details adds even more mystery–really enjoyed it. Happy Photo Challenge. The editing really works here. This is a portrait that could be any walker, so it transcends just your son. Awesome shot, Lisa. I can definitely sense the sense of adventure in this one. Love how you took this shot from behind the leaves. Very creative 🙂 I hope the two of you had a good walk. I love every little thing about this photo! Thanks, LD. 🙂 Ryan and his stick do a great job following/finding the trails and clearing spider webs for mom. 😉 Very handy. I’m glad the feelings of adventure came through in the image, Yvette. Thanks so much for your comment and visit! Emblematic and has a dreamy state quality to it. And excellent touches, Lisa. A grand shot. very positive. It’s like a contemporary take on “The Walk to Paradise Garden (1946)” by William Eugene Smith. I’m glad you like it! I hadn’t had the pleasure of viewing “The Walk to Paradise Garden” before but I’m really enjoying looking through his work now. Thanks for the information.